An excerpt from an Excel financial model. Name 4 collections that you can see in this screen shot, and estimate the number of objects that each contains. Select the range called CostLabour. 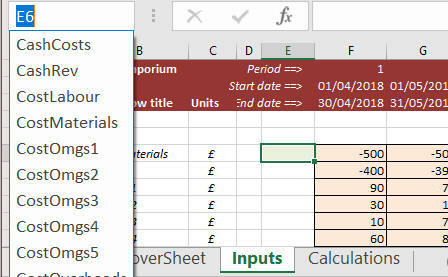 Display the row number of the active cell in a message box. Go to the Calculations worksheet. Finally, see if you can describe the last holiday you went on to your slightly odd friend who only speaks VBA (for the purposes of this exercise you can assume that the collections, objects, methods and properties that you refer to exist within the Excel object model).